These days, craft cocktail menus are full of custom ingredients—these homemade bitters, that “house infusion.” But while some of these additions are best left to the professionals, homemade cocktail syrups are often incredibly simple. Here’s how to make rosemary syrup: Pour some hot water over a bunch of rosemary. Let steep. Stir in sugar. Strain, and you’re done. And once you’ve got a jar of rosemary syrup in the fridge, you’re just a few simple steps away from awesome cocktails, with the intense, woodsy flavor of the aromatic herb. 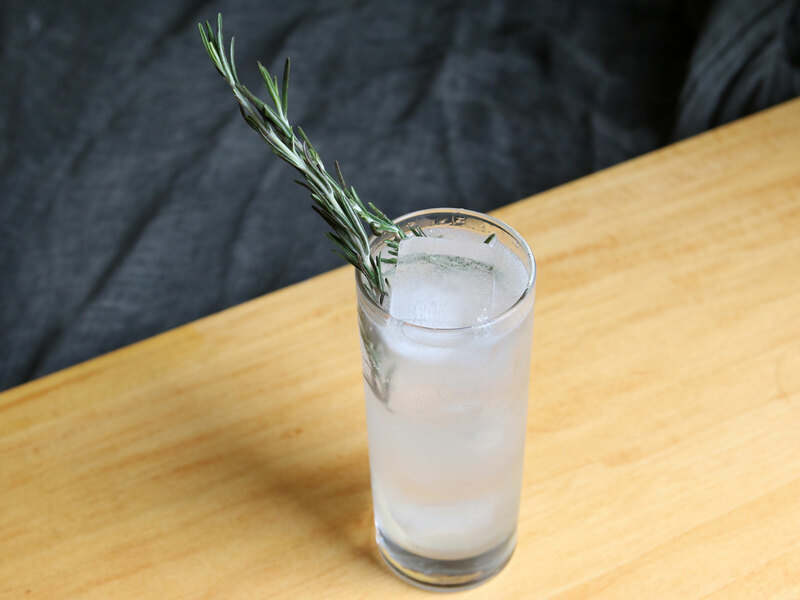 No muddling necessary, no straining out flecks of rosemary spikes—the syrup, and maybe some bonus rosemary as a garnish, is all you need. Here’s how to make around two cups: Boil a cup of water, and pour over 10-12 long stalks of rosemary. Make sure the herb is totally submerged. Let sit for 20 minutes, then stir in one cup of white sugar—leave the rosemary right in there—and stir until the sugar is dissolved. Cover and let sit for at least 2 hours, or up to 12. Strain before using and refrigerate any extra. This drink has “holidays” written all over it, between the piney aroma of rosemary and the familiar winter taste of cranberry. And while vodka is an eternal crowd-pleaser, this cocktail would be amazing with gin, if you’re after something even more herbal, or white rum if that’s more your style. The choice is yours. Instructions: In a cocktail shaker with ice, combine an ounce and a half of vodka, half an ounce of 100% cranberry juice, 1/4 ounce fresh lemon juice, and 3/4 ounce rosemary syrup. Shake up until well-chilled, then double-strain (through a fine mesh strainer, as well as through the shaker’s own strainer) into a cocktail glass. Garnish with a short sprig of rosemary. Good tequila, in our opinion, is still an underrated cocktail ingredient—tequila is much more complex than it’s often given credit for. 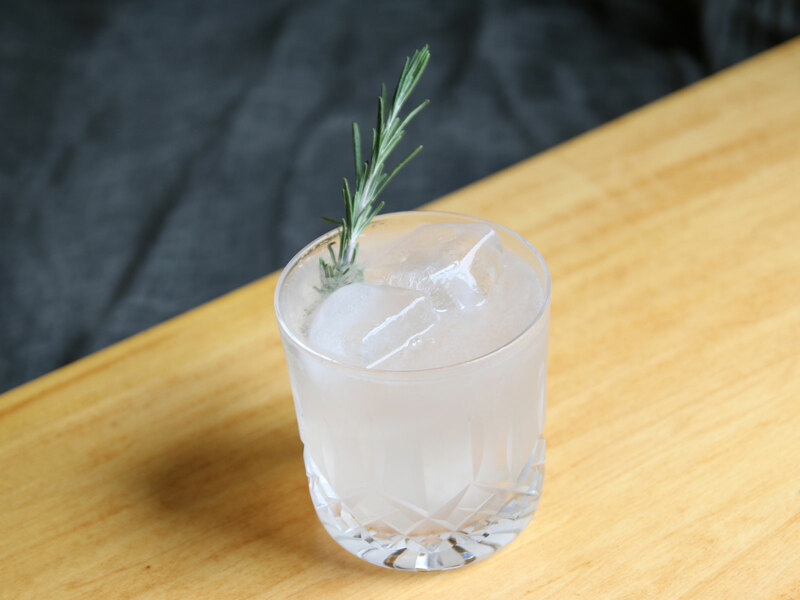 We really love tequila with any herbal or vegetal ingredients, so it’s a slam-dunk with lime and rosemary. Use a big, long sprig for garnish to really amp up the aroma, and therefore the flavor. Instructions: In a cocktail shaker with ice, combine an ounce and a half of silver tequila (we’re using Patrón’s Roca), half an ounce of fresh lime juice, and 3/4 ounce rosemary syrup. Shake up until well-chilled, then strain into a tall glass with fresh ice. Top with two ounces of club soda, give a quick stir, and garnish with a few rosemary sprigs. Anything herbal goes well with gin—that’s just an ironclad rule of cocktails. 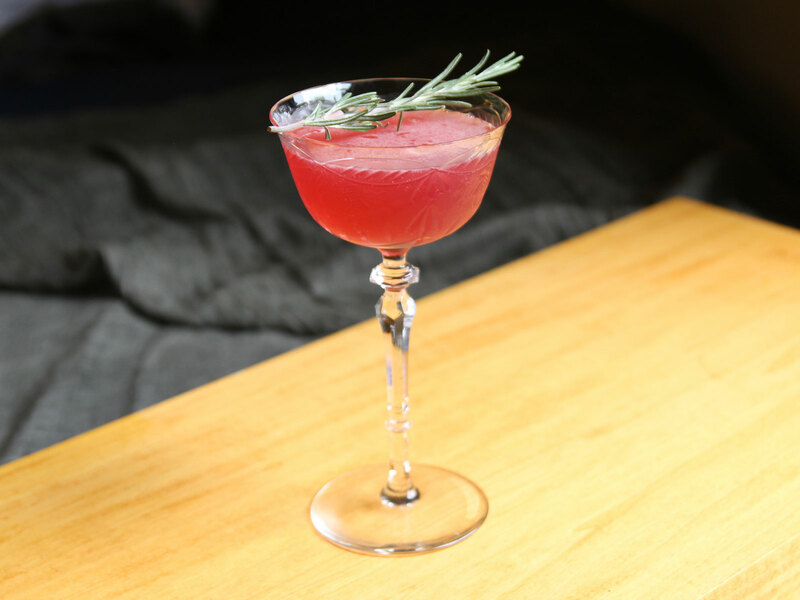 So our rosemary syrup is perfect in a French ’75, with gin and lemon and a big float of sparkling wine. A ’75 is traditionally served up, without ice, but we like this guy on the rocks for a little variation.